Autumnal October is busier than ever for Cantabile! For Cantabile supporters old and new October promises to be a delicious treat. On Thursday 16th October at 7:00pm join Cantabile at Christchurch, Malvern to raise funds for ARCOS a brilliant local charity and their SMILE project. Tickets and more information are available from ARCOS. 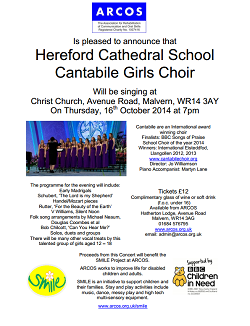 Cantabile’s Autumn singing engagements culminate with Hereford’s own answer to the ‘Proms’ on the 18th October. The Military Charities ‘Proms’ starts at 7:30pm with Cantabile and the fabulous British Police Symphony Orchestra promising to make it a memorable evening for all involved. Tickets can be bought at the Cathedral Shop and also the Outback in Church Street. 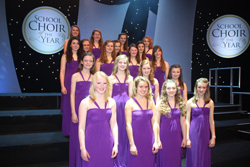 This entry was posted in ARCOS SMILE project, Cantabile Girls Choir, Concert, Fund raising, Llangarron, The Military Charities Concert and tagged ARCOS SMILE project, British Police Symphony Orchestra, Llangarron, Military Charities, The Garron Centre on October 6, 2014 by cantabilegirlschoir.